Wirth Research releases more details and first images of its new Tilt Rotor, Vertical Take Off and Landing (VTOL), hydrogen fuel cell powered, advanced terrain mapping drone. The all-new Unmanned Aerial System (UAS) will be VTOL capable for its long-endurance missions, carrying its primary mission payload of a sophisticated suite of terrain-mapping sensors and on-board data processing capabilities. 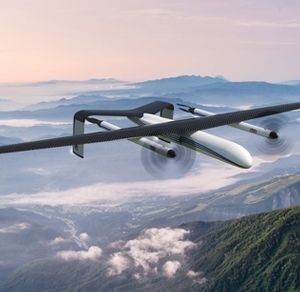 To allow the longest possible endurance with zero in-flight emissions, and reduced vibrations, this unique UAS will be powered by an advanced hybrid power system, featuring a hydrogen fuel cell as its primary energy source. The complete hydrogen fuel cell storage, control and power system will be provided by HES of Singapore, the world’s leading specialist in ultra-light hydrogen fuel cells. The key advantage of the Wirth Research UAS is the combination of its VTOL capability, allowing it to take off and land in very restricted terrain, and its ultra long endurance. These capabilities, and the variety of payloads it can carry, mean that this UAS has applications in a huge variety of sectors. These range from precision agriculture, to pipeline and cable inspection for utilities, surveillance and other security-related tasks, through to detection and monitoring support for ordnance clearance operations. Wirth Research founder and CEO, Nick Wirth, said: “This project continues to present us a fascinating challenge, and it’s great to reveal another key feature of this amazing UAS today. It has been extremely challenging for Wirth Research to meet the requirements of VTOL capability, 6 hour mission endurance, packaging a bulky payload mass and providing that payload with hundreds of watts of continuous electrical power. Solving these issues has required extensive and creative use of our unique Computational Fluid Dynamics (CFD) technology and will demonstrate that Wirth Research’s UAS technology has almost limitless application across multiple sectors. This UAS system can be adapted to carry and power a variety of sensors including stereo high-resolution gimbaled optical cameras, high-resolution infra-red sensors, LIDAR imagers and ground penetrating radar sensors. The ability to carry and power such an extensive range of payloads makes this UAS technology ideal for a variety of industry sectors with multiple applications beyond its primary task of terrain mapping. He added: “We are shifting gears from a 200Wh/kg lithium battery capability to a 700Wh/kg fuel cell energy density capability, one that would radically change the applicability of drones, such as long-distance delivery, large area inspections at faster speed and lower cost, and a reduced need for expensive high altitude sensor payloads.